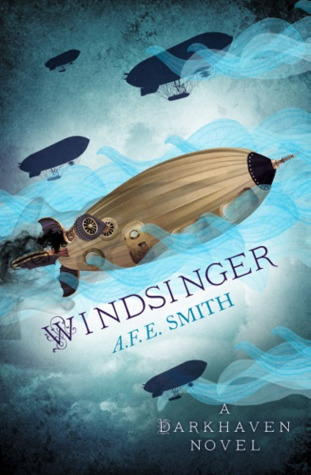 Today I am traveling back to the land of Mirrorvale with A.F.E Smith's Windsinger (Darkhaven #3). I have had the pleasure of reading the first two books in the series and I am a big fan. This book does not disappoint. It is filled with action, mystery, airships, and this wonderfully unique city structure I have come to really like. As we begin this book, Ayla, Overlord of Darkhaven, is sitting down to sign a peace treaty with the Kardise ambassador. Unfortunately, before the papers can be signed the Kardise official is found dead, poisoned and Ayla is the only suspect. Tomas Caraway and the Helmsmen must rush to find the real murder before war breaks out between the two countries. To add more complexity to this story a huge Parovian airship, the Windsinger, is heading towards Ayla with the intent to capture the heart of Mirrorvale. Smith created another wonderfully twisted mystery which kept me trying to pinpoint the murder throughout the entire book. Each book has gotten a bit darker but I think with the subject of the impending war in the plotline it is something that must happen. She also does an excellent job developing the supporting roles in her books. Ree, the first female Helmsman, finding out she is about to be given in an arranged marriage; Xander, Karise-born son of a wealthy man insisting his return home as part of the peace treaty; Miles partner to the Weaponsmaster who has a terrible moral dilemma, Naeve Sorrow, the former sellsword, must choose to return to her sellsword ways or aid Ayla's Helmsmen in search of the murderer. The book is told from a multiple person point-of-view which only adds to the layers of storytelling by sending the reader to different parts of the world she has created. It gives the story depth and helps us readers identify with the world as we see different angles of the story unfolding. I could feel the screws tightening as time was running out to find the real murder, skirmishes started breaking out near the border of the two countries, and Ayla finds herself having to rely on her changeling form to help protect her people, friends, and family before something devastating happens. I would definitely recommend this series to fantasy book lovers. A.F.E. Smith is a master juggler of the elements that make up a fantastic read.